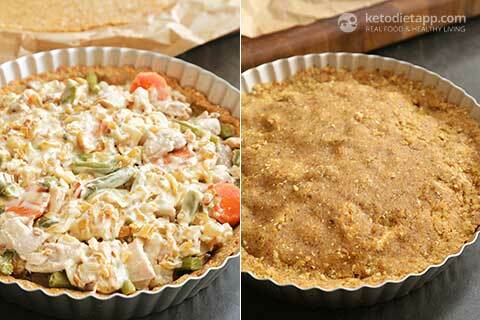 When I asked on Facebook what you'd fill my Savory Keto Pie Crust with, most of you mentioned Chicken Pot Pie. 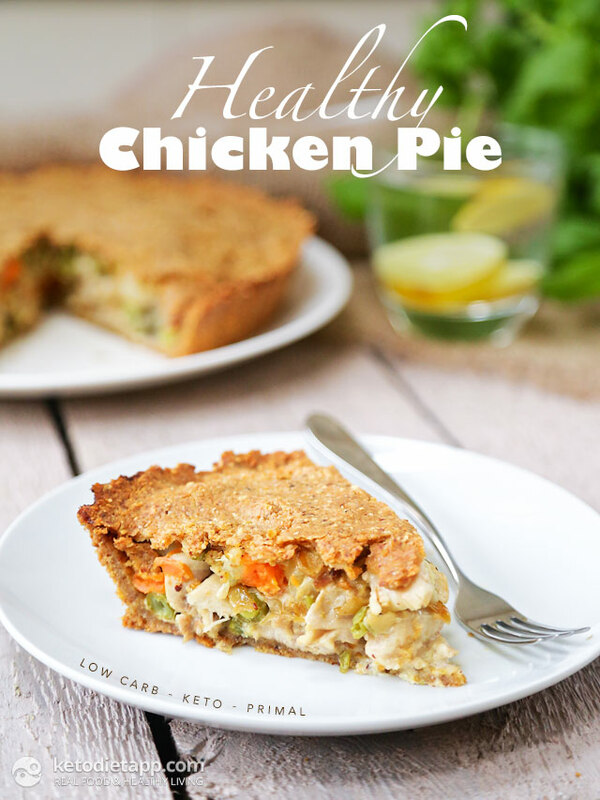 This pie is equally delicious and comforting, and it's slightly different from the traditional pot pie which only has the crust on top. Unlike my Tortilla dough, this one is not as elastic and is more difficult to roll out - that's because there is no psyllium. You'll need to rest it in the fridge and use 2 pieces of parchment paper while rolling to avoid tearing it. On the other hand, using this dough has its advantages - it has less carbs and tastes amazing! 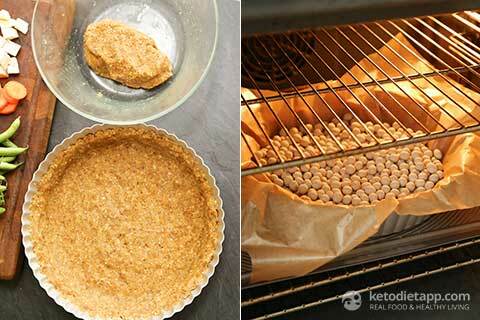 Prepare the Savory Keto Crust by following this recipe. - just make 1 1/2 the amount of the recipe to have enough crust for the top of the pie. Only use 2/3 of the dough to press in the pan - leave the rest for the top of the pie and keep it in the fridge. Bake for 12-15 minutes (see detailed instructions here). 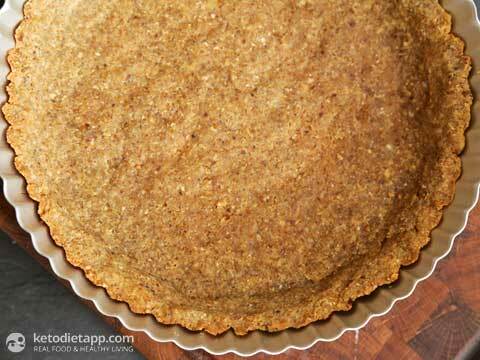 When the pie crust is done, remove from the oven and let it cool down. 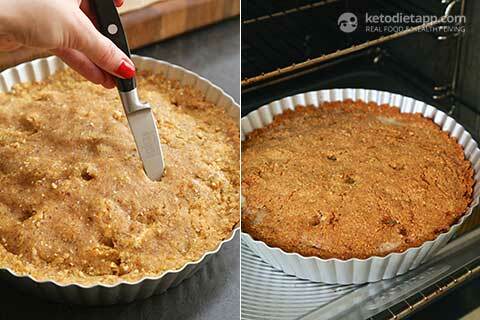 When cooled, loosen the crust from the edges and bottom - use a sharp knife if needed. Meanwhile, dice the chicken thighs, peel and slice the carrot. Peel and dice the celeriac and cut the green beans into thirds. Place everything into a saucepan and add the water and salt. Bring to a boil, then reduce to medium-low, cover with a lid and cook for 15-20 minutes. Meanwhile, peel and finely chop the onion. Place on a pan with all of the butter (or ghee) and cook over a medium heat until caramelised. This can take up to 15 minutes - mix to prevent burning. Preheat the oven to 200 °C/ 400 °F. 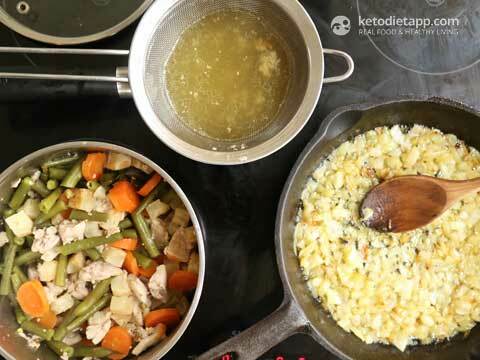 When the chicken & vegetables are cooked, pour the stock through a sieve and keep the vegetables and meat in the pot - set aside. 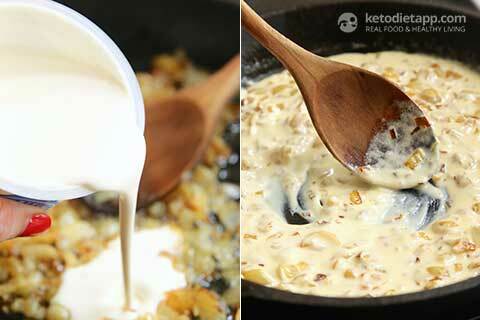 Pour the cream into the pan with onion and stir to combine well. 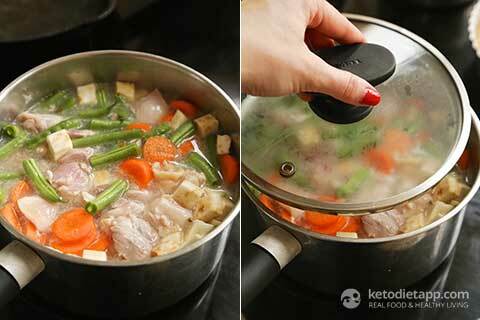 Add 1/4 cup - 3/4 cup of the chicken & vegetable stock and mix well. When done, season with salt and set aside. Keep the remaining stock for another recipe. First time I made the pie, I only used 1/4 cup of the stock, second time it was 1/2 cup which I personally preferred. The pie was not too dry and not too soggy either. Roll out the remaining dough for the top or the pie. 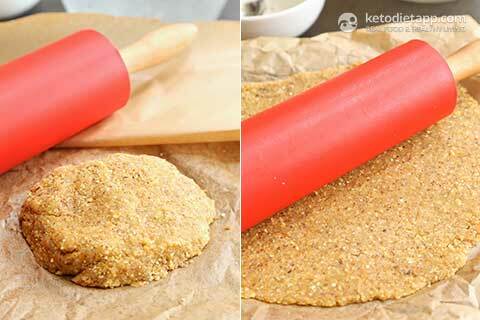 You'll need to place the dough between two pieces of parchment paper while rolling to avoid tearing the dough. 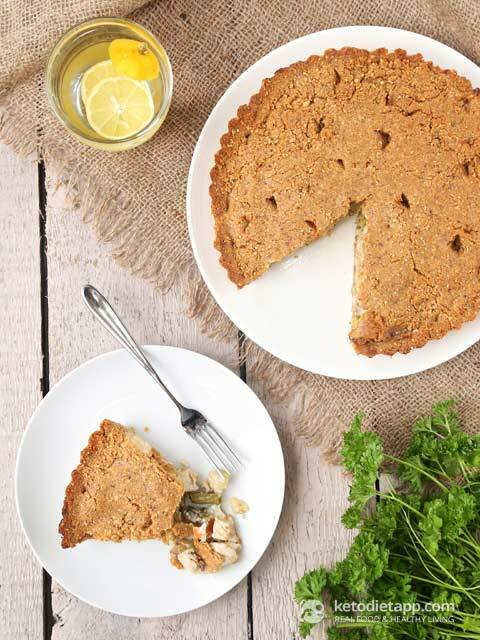 Try to achieve a round shape that will fit the pie. 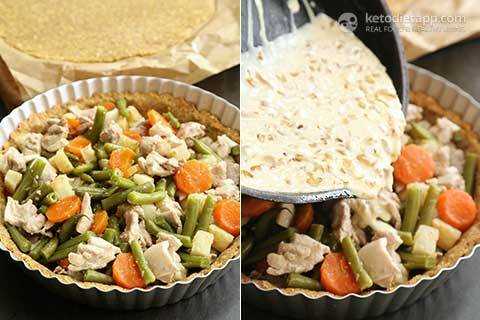 Place the drained chicken & vegetables into the pie crust. 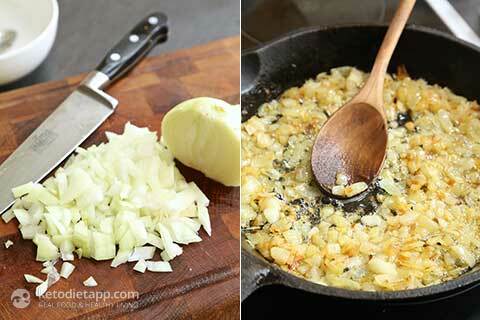 Add freshly chopped parsley and pour in the creamed onion and spread evenly over the topping. Top with the remaining rolled out dough and press towards the edges. Using a knife, make several small slits in the top to allow steam to escape. Place in the oven and bake for about 30 minutes. When done, remove from the oven and set aside for 10-15 minutes before serving. Enjoy! Hi Martina, what if I'm not able to buy pork rinds for the crust? You never said when to add the 1/2 cup of butter. I know you said to butter the pan for the onions, but are you supposed to put the 1/2 in with the onions or the chicken vegetable mixture when its boiling???? This is probably one of my fav chicken recipes. Can you please make chicken and dumplings? Thats probably my 2nd chicken recipe. Thank u Martina! Hi, my husband is allergic to nuts so if there something else I can use? Like flaxseed again? Hi Bec, you can try using the same amount of flaxmeal or pork rinds or about half the amount of coconut flour. Hope this helps! Great recipe. The only issue is that I avoid flaxseeds. Can I substitute with something else? For example with psyllium husk. Hi Eleni, if you don't eat flaxmeal, use the same amount of almond flour instead - or if you use psyllium, use only ~2 tablespoons. Just a question about the amounts - the 3 cups of pork rinds, normally a cup is 250g or thereabouts, so is 3 cups the measurement before processing them into crumbs? Same question for the flax and almond floor, go by weight or by cup? Hi Christine, I'm using home-made pork rinds and I think different products may weigh more. The amount (3 cups) is already powdered and weighs 150 grams. As always, and especially in all baked goods, go by the weight. Hope this helps! To me, potpie only has a top crust. So u'd halve the crust carb count right there! Awesum looking recipe as usual, Martina! Getting everything together to make individual pot pies for my kiddo this weekend (yes, I'm the same person who commented on your savory crust post on the 5th!). I plan to replace the heavy cream and chicken stock with a DIY cream-less cream of mushroom soup, which I hope will make it POP! I also plan on cooking and freezing these. I will post with my reheating results (we don't use/have a microwave). This looks very yummy! I plan to try it and will let you know what we thought. I am hesitant to purchase pork rinds. I see your link to the product - it is still considered a healthy food then? Also, I wondered if you could fry up chicken skins and use those instead if you wanted? I found a recipe to make my own pork rind - I am just curious about what they fry the packaged ones in is all  Thanks for the recipes! !